The internet, which emerged this year as a leading source for campaign news, has now surpassed all other media except television as a main source for national and international news. 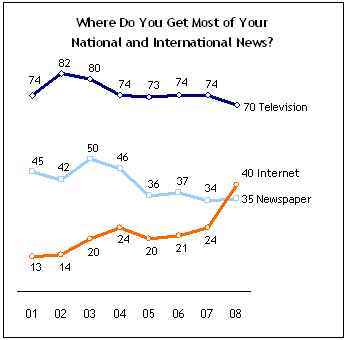 Currently, 40% say they get most of their news about national and international issues from the internet, up from just 24% in September 2007. For the first time in a Pew survey, more people say they rely mostly on the internet for news than cite newspapers (35%). Television continues to be cited most frequently as a main source for national and international news, at 70% but I m sure this is not going to be the case for a long time. The percentage of people younger than 30 citing television as a main news source has declined from 68% in September 2007 to 59% currently. This mirrors a trend seen earlier this year in campaign news consumption. As mobile devices become data-enabled, more and more people will be accessing news from their mobile terminals and soon we will reach a point where almost all news are consumed online. Its really not too far away from where we are now. I have for a long time not made any purchases on newspapers and its only a matter of time where i will soon get quality live streaming of mainstream news on my mobile.